How long does pool excavation take? 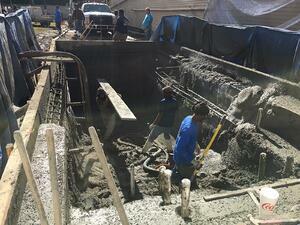 Depending on the size of your pool, excavation can take anywhere from a few hours to a few days. The bigger and deeper the project, the more time it will take. Weather also plays a factor in this process, as well as existing elements that may need to be moved and/or broken up and removed (like existing concrete or masonry). How can you help to prepare your yard for pool excavation? Preparing your yard for excavation begins with clearing the area and surrounding space and access points. Move any outdoor furniture, grills, plants, play structures, and debris; making your yard as clear as possible for the accommodation of workers and equipment will help to expedite this process. It may also be necessary to remove portions of a fence or gates in order to access the pool area, and remove excess dirt. What happens with the excess dirt that occurs from pool excavation? Of course when you dig a big hole, you’ll be left with some excess dirt. Once all of the soil, rocks, sod, and other debris is removed, some of it can be used for backfilling around the finished pool area. The rest will be removed and hauled away. What kind of equipment is used during pool excavation? Excavation is performed with the use of large equipment, called excavators. However, depending on the design of your pool, and the space in your yard, smaller, more compact machines can be used. What happens if there is water or rock underneath the ground? There can potentially be rock or ground water underneath where your pool will be built. If rock is found there are a few options, including: moving the pool to a different location, elevating the pool in the same spot, or hammer out the rock. If water is found a dewatering system can be installed to keep the hole dry until the pool is built. Elevating the pool is also an option in areas where the water table is high.